Offered is a nice little American coin silver master salt spoon by silversmith Albert Titcomb (1802 - 1890), who was working in Portland, ME between about 1823-35 alone and between 1835-46 in partnership with Philip Titcomb in Portland. After 1846, Albert continued to work as a silversmith, but moved his shop to Bangor and worked there until about 1880. 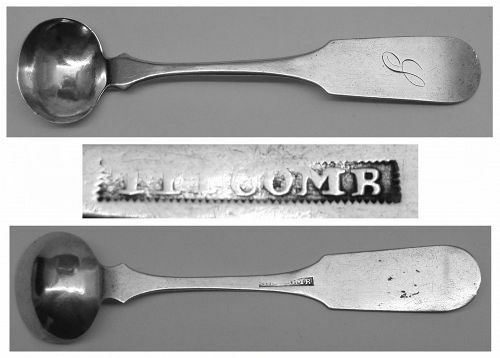 This piece was almost certainly made during Albert's Portland years, and the mark of TITCOMB in a serrated punch could have been used by him alone, or in the partnership - if not both. This piece measures about 4 1/16 inches in length and weighs about 6 grams. It has a legible maker's mark and a period script monogram. All in all a fine piece of Portland coin silver!